It’s that time of year to send holiday wishes to friends and family you may not see during the year. I LOVE to receive Christmas cards from other people and always post them on a door as part of my decorations. Other people like to look at the cards I’ve received and get ideas from them. There are also some really pretty card holders that showcase your cards. 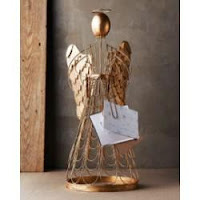 This angel card holder is exquisite and is on sale at a great price now. I save my cards from year to year to recycle the art or paper for other projects. My mini-peeps sometimes make cards for their friends and other family members by recycling cards that I have gotten. You can also make tree ornaments or placemats out of cards. When my daughters were younger, I used the cards as lacing cards and they loved them! You can also use a template to make bitty boxes out of your cards to give small treasures to people or decorate a table at a place setting. It’s important to sign your cards personally and include a little message inside the card. Something as simple as a “Merry Christmas to you!” or “Happy Holidays” to friends who do not celebrate Christmas is fine. Make your cards personal to the receiver and let them know that you're thinking about them. When you’re sending your cards, don’t neglect the envelope! You can make pretty address labels or write the envelopes by hand in your best penmanship. Although it is common to put the return address at the upper left hand side of the envelope, remember that the correct format for social correspondence is to put the return address on the back of the envelope. Here are some of my favorite cards this year. 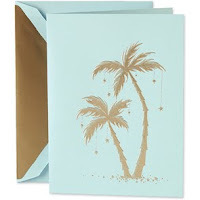 Under the Palm Tree is offering a 25% discount off of all of their Lilly Pulitzer paper goods including cards, stationery, and wrapping paper today! What a great way to stock up on holiday cards. On a personal note, my goal for today is to have my Christmas cards in the mail before tomorrow morning! Have you sent your Christmas cards yet? Super cute ideas! I love the palm tree! Im a little OCD with my cards.. I have always been able to get them out by Dec 1st! My thought behind them are.. most of my friends use them as some part of Holiday decor, so if I can get them out early, more people can enjoy them! Thanks! Isn't the palm tree adorable! You're right about sending cards early. Most people I know decorate with them, too. Have a fantastic day! 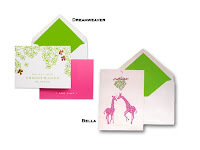 I love the Lilly cards...o cute! I always save cards to reuse in crafts too! The card holder is from Horchow! It's on sale, too!